Using serrated knife, cut rounded dome from top of cake to make flat surface; place cake cut side down. Cut cake as shown in diagram (template can be found under the Tips below). On tray, place cake piece 1. Arrange pieces 2, 3 and 4 as shown in diagram, trimming to fit, standing up piece 3 for top fin. Trim point of piece 2 for nose of shuttle. Attach each piece with a small amount of frosting. Frost cake with a thin layer of frosting to seal in crumbs. Freeze 30 to 45 minutes to set frosting. Add final coat of frosting to cake, using up remaining frosting. Use licorice to make diagonal lines across nose of shuttle and to outline top fin. Use M&M's™ minis chocolate candies to outline tip, wings and back of shuttle. Add large and small stars to wings and back; add round candies to both sides of fin. 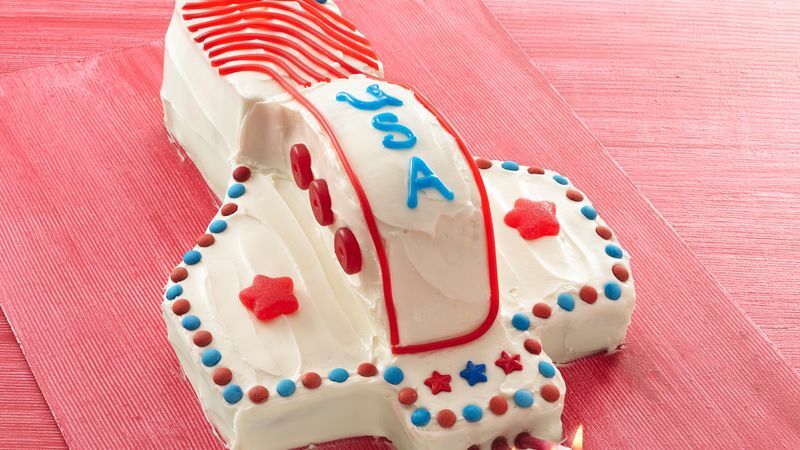 Write "USA" or another message on top of fin with decorating gel. Insert candles at end of shuttle. If desired, just before serving, light candles for "liftoff." Store loosely covered. Need some extra help? See how to make it. Place strips of waxed paper under corners of unfrosted cake pieces. After frosting, just remove waxed paper strips. No cleanup needed! Get a party menu, prep guide, tips, party games, activities and more for an Out of This World Space Party!